Rodger, Robert “Scottie”, 80, of Liverpool, Queens County, passed away on Thursday, March 22nd, 2012, in the South Shore Regional Hospital, Bridgewater. Born in Largs Ayrshire, Scotland, he was a son of the late George and Mary (Fraser) Rodger. Scottie was Veteran of the Korean War, having served 25 years in the Royal Canadian Navy, where his main job was running the boilers on the ship. Retiring from the Navy in 1975, he moved to Liverpool to become the maintenance man for the local school district, working there for several years before finally going to work at the Queens Manor, Liverpool, also in the maintenance department. He was a member of St. Gregory’s Catholic Church, Liverpool, the Admiral Desmond Piers Naval Association and he was the current president of the Royal Canadian Legion, Branch #38, Liverpool. Scotty recently received a Meritorious Service Medal for outstanding service to the Royal Canadian Legion and to the community. During his many years with the Legion Scottie enjoyed going to the local schools to talk to the children about the importance of Remembrance Day Activities. Over the years Scottie was very active volunteering in the Liverpool Minor Hockey Association and he also spent many seasons as the manager for the old Liverpool Schooners Fastball Team. He was a loving husband, father, grandfather and great grandfather. He is survived by his loving wife Margaret; daughter Heather (Terry) Scotland, of East Preston; sons Graham (Barb), of Edmonton, Robert, of Dartmouth; stepdaughter Bernadette (Mervin) Hartlen, of Milton; stepsons Kevin (Tina) Whynott, Lee (Jane Ann) Whynot, both of Liverpool; grandchildren, Colin, Corey, Craig, Carrie, Trish, Cody, Robbie, Ryan, Eli, Jillian, Stephanie, Amanda, Ashley, Amber, Rachael, Ashley, Kale, Darcy; great-grandchildren Kashton, Lily, Makayla, Kalia, Joshua, MacKenzie, Maddison, Ellie, Ruthie, Sam, Tess, Trey, Isaac, Alexia; his 1st wife Unamarie Rodger; several nieces and nephews. He was predeceased by a brother George. Margaret,and family sorry to hear about scottie, i was proud to be his secretary for him at the legion. he was great guy i was very glad i had the chance to get to be working side by side with him at the legion easpecially when remembrance day and getting the poppies ready to go out to be sold at the stores. he was a very lovely man. enjoy your memories of the times you had with him. we are praying for your family in this sad time. To Margaret and family it is with great sadness upon hearing of Scottie’s passing.He was a fine man who worked hard for the legion and his community we will miss him on Reembrance Day but our thoughts will be with him on that special day.Our prayers are with you and family. 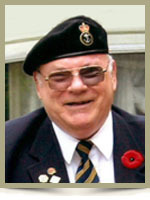 He was always my favorite speaker on Rememberance day at school. A very nice man as well. We are very sorry to hear of Scotties passing. Our thoughts and prayers are with you all. MARGARET & FAMILY ,VERY SORRY TO HEAR OF SCOTTYS PASSING .THINKING OF YOU AT THIS SAD TIME .GOD BLESS. We are so very sorry to hear of Scottie’s passing. He has been well known to us for many years through Queens Manor, RCL #038 and locally in the community! He was a great man, a wonderful friend and a rock steady, positive influence at the Legion! He will definitely be missed by many! God bless you all! Margaret and family: We were sorry to hear about Scottie: I always enjoyed our chats when we would run into each other. He was a good man and he will be missed by everyone that had the opportunity to know him. MARGARET & FAMILY ,WE ARE SO SORRY FOR YOUR LOSS.THINKING OF YOU AT THIS DIFFICULT TIME . We are sadddened to hear of the passing of Scotty. He always brightened a room with his witty conversation. We are so saddened to hear about Scottie’s passing. He always had a big smile whenever we saw him. He will be missed. Our thoughts and prayers are with you. God bless. To Scotty’s Family so very sorry to hear of his passing.My thoughts are with you all at this sad and diiifficul time ! To Margaret and all of Scotties family,my thoughts and prayers are with you all.Scottie and I worked together at Queens Manor different dept.We had some good laughs,and a few disagreements along the way.But he was a great person to work with and always a good friend. My thoughts and prayers go to all of you at this most difficult time,Keep your memories close to your heart. We are so very saddened to hear of Scotties Passing. I myself will miss Scottie coming to the Sobey’s store every morning for his groceries. We use to have quite a chat while I was ringing his groceries in. Scottie was a great Man and I enjoyed waiting on him. He will be greatly missed by everyone. May he now Rest In Peace. God Bless you all at this most difficult time. Very sorry and saddened to hear about Scotty’s passing. He was a wonderful man and someone I considered a friend. We always enjoyed his visits to our school and valued his time with us. The Heavens must be a little brighter with Scotty around. He will always be remembered well. So sorry to hear of Scotties passing. My thoughts and prayers are with you all at this sad time. So sorry for your loss. He was such a great guy. Sorry to learn of Scottie’s passing. He was always pleasant and cheerful and hopefully the good memories you have will give you comfort at this difficult time. Please accept our sincere condolences at this very difficult time. We are very sorry to hear of Scotties passing.. Our thoughts and prayers are with you. Our sincere condolences to Margaret and family. Our thoughts and prayers are with you all at this time. Scotty was a well liked man and will surely be missed by many. We are going to miss Scotty and his great way of greeting everyone by name (and Rememberance Day will not be the same without him. )Our thoughts are with you. Stephen and I are so sorry for your loss. I had the Honor of working with Scottie at the Manor and a finer man you’ll never meet. He always had a smile and a big hello whenever we crossed paths. The void he leaves within our community will be felt by many and I pray the memories you hold within your hearts will help you through this time of grief. Our deepest sympathy to all of you. So sorry for your loss. Scottie will be missed by everyone who knew him. He was so friendly with everyone and called people by their names all the time. He will be missed at church and the Legion won’t be the same without him. My thoughts are with you at this time. Remember all the good times to get you through. So sorry to hear of Scottie’s passing. Mike always spoke fondly of the time he spent with Scotty at Lee’s cottage during hunting season. He was a great guy who will be missed. Our thoughts are with you during this difficult time. To Scotties families, We were shocked and saddened to hear of Scotties passing. He was a great and caring man who was loved by all who knew him. He was a friend who will be greatly missed by everyone. The Legion will never be the same without him. Cheerish his many precious memories. Our thoughts and blessings are with you. All Scottie’s Shipmates in the Admiral Desmond Piers Naval Association were sadden to hear of his crossing the bar. Our sympathy and prayers go out to you, his family. He is in our prayers. So sorry to hear of Scottie’s passing, he will be missed by many in our community, he was a fine man. Thinking of you. RIP Scottie. Aunt Margaret, we are so sorry to hear of Scottie’s sudden passing. Our thoughts and prayers are with you and the family at this difficult time. Margarewt and Family, Our sincere sympathy. There is nothing to be said that has not been said about “Scottie.” He was just a great guy who lived life as God said you should. We all loved you my friend, and how could we not. Our deepest sympathy to all Scottie’s families. so sorry to hear about Scottie .Our thoughts and prayers are with you and your family . at this sad time sad time. So sorry to hear of Scotty’s passing..will miss his warm and friendly smile each time he came in the blarney stone..
We were so sad to hear of Scotties passing.He was a wonderful person.Mike and I both thought a lot of Scottie.We spent many hours together working in the canteen at the rink.He was always so pleasant and thoughtful!You will be in our thoughts and prayers! Margaret and family, we are so very sorry that you have lost Scottie. He was a wonderful person. We all have great memories of Scottie, and will miss seeing him at all the events relating to the Royal Canadian Legion Br. 38. Also seeing him at lunch on Sundays after church. May God Bless you. You are in our prayers. Susan and Butch MacLeod. How can we say goodbye to that lovely man, such a gentleman he was, we can’t imagine not hearing his voice at the next Rememberance Day service. His friends and family who have gone before him are now the lucky ones to have him with them. So, sorry to hear of Scottie’s passing. Our deepest sympathy goes out to all of you. We will keep you all in our thoughts and prayers. May Scottie R.I.P. To Margaret and Scottie’s family and friends, I extend my sincere condolences. Scottie will be sadly missed but fondly remembered by all that knew him over the years. He was a great guy and Heaven is a better place with him there with his wonderful smile. God must have needed a very special Angel. Take care of each other and let your fond memories get you through this difficult time. Very sad to hear about Scottie. He was a genuine nice man, one that I had a great deal of respect for. To the family we give our sincere condolences. Our thoughts and prayers are with you at this difficult and sad time. So sorry for the loss of Scottie.He was always up for a chat no matter where we seen him… Always a big smile and wanting to know how the family was…He surely will be missed by all who knew him…you are in our thoughts at this difficult time. I’m so sorry to hear of Scottie’s passing. I met Scottie through working at the manor. Always a very nice person. My sincerest condolences to Margret and family. Margaret, Bernadette,Lee and families–We were saddened to hear of Scottie,s passing. He was a great Legion Member and Officer. He will be greatly missed by all who knew him. Your family will have wonderful memories to share with each other. Lloyd & Barbara Naugler. So very, very sorry to hear of Scottie’s passing. He was a great man and will be missed by all who knew him. Dear Margaret and family, So sorry to hear of the passing of Scotty. I considered him a friend and great man to do business with while I was operating my business there. His contribution to the community was also greatly appreciated. My thoughts are with you and may your fond memories help you move forward. Robbie, sorry to hear about the passing of your dad. My deepest sympathy goes out to you at this time . Know that I will Keep you in my prayers. Scotty will be missed, he was always a smiling presence at our school during our Remembrance Day Service. I am sorry for your loss. We are so very sorry . Please except our deepest sympathy. and your spirit renewed by God’s loving presence . Scottie was a very special man. Our thoughts and prayers are with you.I was so sad to hear of Scotties passing. I enjoyed waiting on the two of you when you come to lanes. scottie was a great person and will be missed by all that knew him. You take care margaret. Hope to see you soon. Margaret, and Family–We are so sorry to hear of your loss. Scottie was a wonderfil person and will be greatly missed by all who knew and loved him, especially the legion where he was an important member. Our thoughts & Prayer,s are with you all at this sad time. Having the chance to meet my Great Great Aunt Margaret and her husband Scotty was such a honor to me while I was living in Nova Scotia. Scotty was an amazing man who was so easy to have chats with. He will truly be missed.